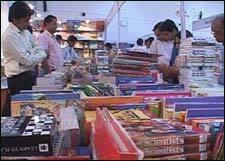 Hyderabad Book Fair is an event that took place between 01-Dec-2006 and 11-Dec-2006 in Hyderabad. The biggest literary bonanza of Hyderabad is back! And if you are not literate, do it fast - this ends on Dec 11th. The 21st edition of the Hyderabad Book Fair will be held at the People's Plaza grounds on Necklace Road, from 1st to 11th December. There will be about 200 stalls, of which 120 will display English books, while the remaining 80 will, regional language books. The menu consists of about 100,000 titles on literature, fiction, personality development, children's writing, software and engineering, by publishers like Oxford University Press, Cambridge University Press, British Council, Orient Longman, Publication Division, S Chand, Kuwait Embassy, National Book Trust, Visalandhra Book House, Prajasakthi, Navayuga Book House, Best Books, Navodaya, Emesco, Milind Prakashan, Kendra Sahitya Academy, and many Urdu publishers. During the 10-day fair, lectures and discussions by authors will be organised daily, on different aspects of literature, poetry and personality development, and the changing trends in media. A 10% discount is being offered on all purchases to encourage the habit of reading. This annual book fair is the 3rd largest in India, after Delhi and Kolkata. The entry for the fair is Rs. 5 per head. Students and teachers are exempt from this, too. For further details, please contact 2475-4688/0368. Be the first to comment on Hyderabad Book Fair! Just use the simple form below.